We helped a local Fabric and Upholstery supplier develop an on-line inventory system. The system integrates directly into their Microsoft Dynamics Accounting software. A roll of fabric is removed from the warehouse and a quantity is cut to order. The inventory and billing system is updated in real time. 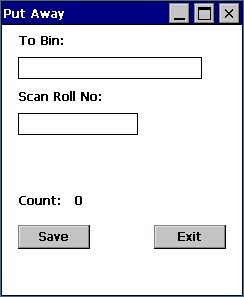 The locations of the rolls of fabric are updated using a Put Away function. Intermec CK31 and CK71 mobile devices run a custom vb.NET program to process order and manage inventory. Zebra desktop label printers are used to produce updated roll labels on demand. The system uses Cisco Access points to provide wireless coverage in the warehouse. As each order is processed, the Microsoft Dynamics database is updated using a set of custom SQL stored procedures. An operator scans the Work Order Number, the roll number, and the quantity of fabric to remove. A new label with the updated quantity is printed and the roll is put back into a location in the warehouse. 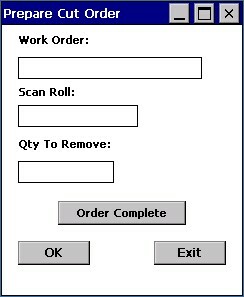 The information is saved locally in the hand held until the user clicks the "Order Complete" button. All items for that order are then sent to Microsoft Dynamics. Switchboard, our middleware product, manages the communications between the Intermec device and the database. The roll is scanned back into its location in the warehouse and the Dynamic system is updated in real time. This system has been operating for eight years and has replaced many hours of manual work recording inventory transactions, and has eliminated shipping errors. The accuracy of the inventory has been improved greatly.